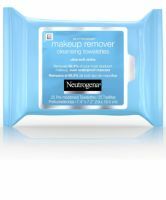 These makeup wipes from Neutrogena are some of the best that I have tried. I prefer not to use wipes because they can be harsh and are not as effective as an actual cleanse. However, wipes are great for travelling or when I am just too darn lazy to cleanse properly. These are wonderful because they don't sting or irritate my skin at all. They are more oily than other wipes I have tried which i...read mores perfect for makeup removal because it breaks up the oil in my makeup and wipes away clean. My skin is not left feeling dry or stripped but instead feels refreshed. I wish these were unscented but the scent isn't too overpowering like some wipes. I absolutley adore these wipes! They are great to use on the go. I can remove all my makeup with these and they leave my face feeling really refreshed. The only other wipes I've tried are the Yes to Cucumbers and those really stung. I don't have that issue with these. I have even noticed an improvement in my skin. I guess its really cleaning all the makeup and dirt off my face and my pores aren't ...read moreclogged anymore. Whatever the reason is I will keep using these wipes. I would recommend these to a friend.